Hi All. We are both having a good time at present. The MVC performed to a packed house at the very up-market Paradour Hotel in Javea on Wednesday, we have the private view of the art exhibition at the Art House at Benidoleig tonight, and a concert in a massive shopping centre tomorrow. 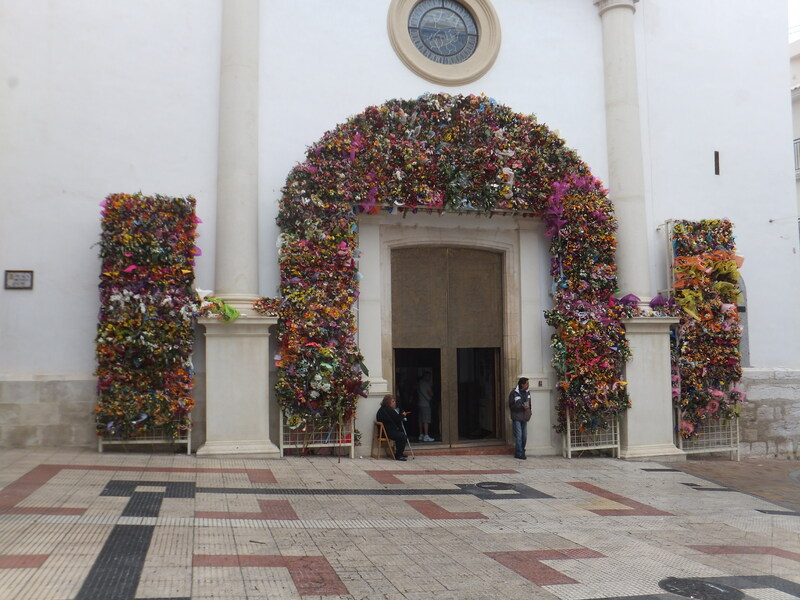 On Sunday we are attending a classical concert at the Fisherman’s church in Javea which is an amazing building with great acoustics, then out to dinner with friends. Tuesday is a charity concert at El Verger. It will be good to see Ann and Alun Price, who have been back in Wales for a month, again. Alun may be very terse and dressed all in black after Wales play South Africa on Saturday, but the baritones will be pleased to have him back. Good to chat to Simon Hillyard on the phone last night. Looks like an exciting year coming up for them, and I hope they can make it out to Spain to see us in February. After a ridiculously warm few weeks the weather has now changed, with strong winds and temperatures down to ten or eleven at night, but still only a smattering of rain which gets dried off the surface before it can do any good. Crops of all major agricultural products have been halved or worse. The grapes were tiny, and the oranges and lemons didn’t set properly, so the crop will be terrible. Almonds which are a staple of the local turron industry have doubled in price because there is such a shortage, and fruit and veg are more expensive at the market. Another year of drought would be a complete catastrophe. I loved reading in the English press that Prime Minister Rajoy is claiming that Spanish politicians are not corrupt. There can never have been a more venal, immoral and self-serving bunch of bandits in power anywhere since around the fall of the Roman Empire. 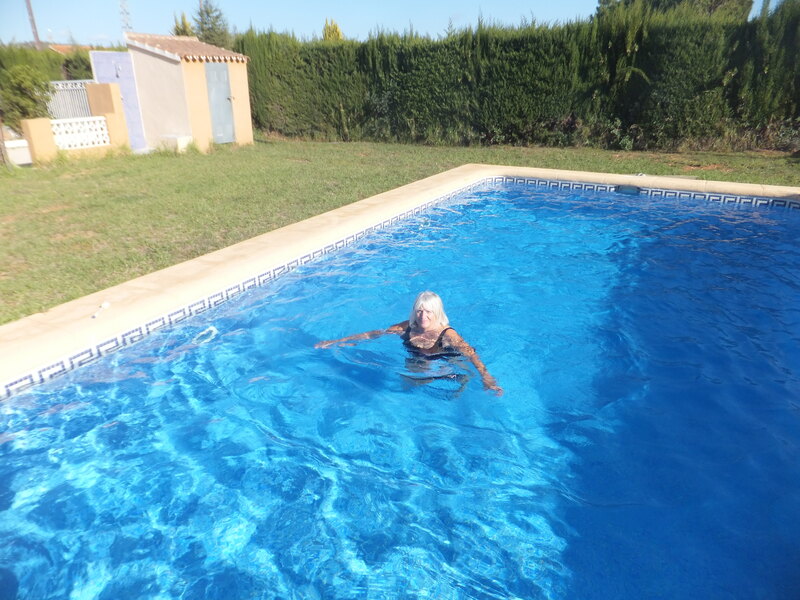 The Spanish people seem to have reached the point where they shrug their shoulders, give a rueful grin and get on with life but stories emerge every day of expats who have been rolled over for their entire life savings by local mayors, planning officers, party representatives and councillors. The longer we are here the more we think that buying is simply not a sensible option, but there is no doubt that we both feel better and are thoroughly enjoying being here. All the best, Andy. Hi All. Not sure quite how it has happened but we seem to be really busy at present. We have an Art exhibition at the end of the week which we both have two pictures in, so we have both been painting quite a bit. (Close relatives can now climb off the floor where they no doubt fell in shock when they read this). I never thought I could learn to paint, but our teacher Julia is really good, and I am getting quite hooked on it. I also have six concerts between now and Christmas, and seem to have taken on a part time job promoting a really good musical duo called “DOLCE DIVAS”. Our friends think I’m completely mad, but I really needed something productive to do. We are also looking at the possibilities of developing a language homestay business next year. Ann is doing Pilates twice a week and is feeling better for it, and we are lunching with friends a fair bit. Really looking forward to getting home at Christmas. It seems like ages since we saw everybody. A shame it will be a flying visit, but we are planning a longer one in April. All the best. Andy. PS would still love to know who is following us in Brazil. Why not leave us a comment? This is Blessing. 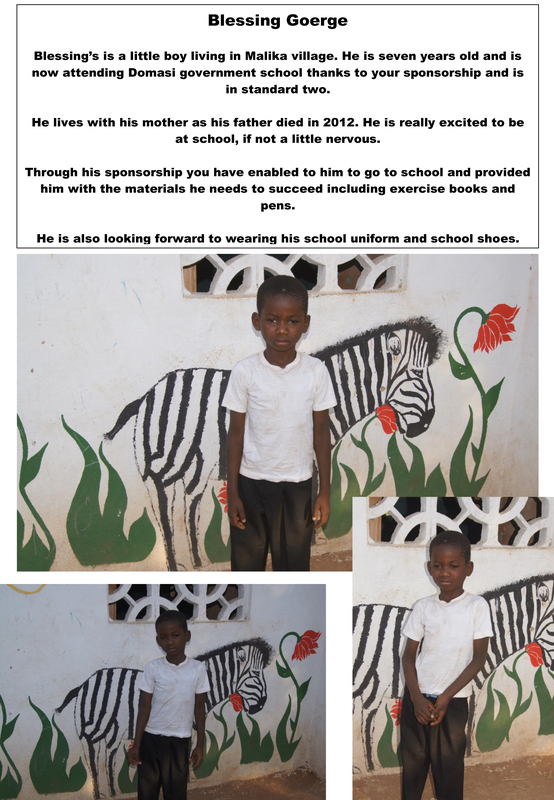 We are sponsoring his education through Nikki Luxford’s Charity, One Step Malawi. He is seven years old and lives with his mother. Have a look at Nikki’s website One step Malawi to see the amazing things she is doing there. Nikki is a reporter on the Costa Blanca News who used to live in Worthing and went to The Vale school. 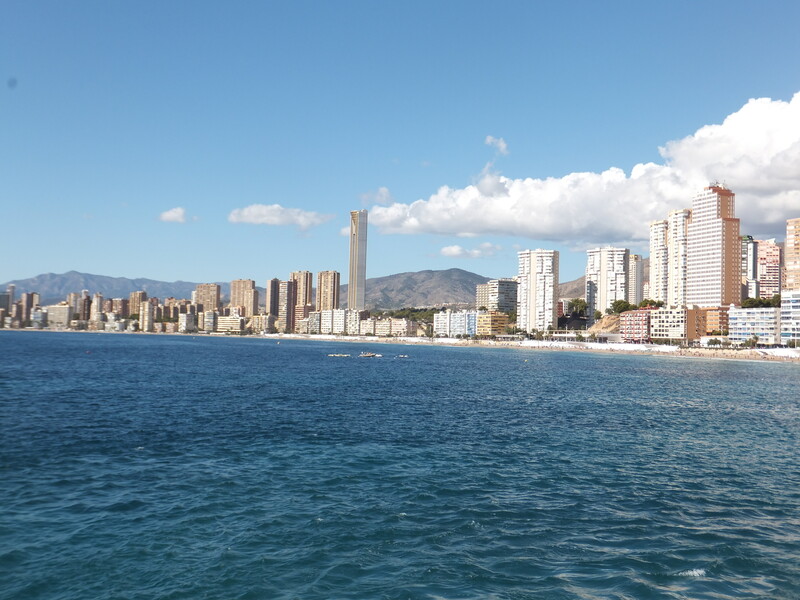 Benidorm is OK in November. The sun was shining, the sea was blue and there were not too many people around. The town is still busy. 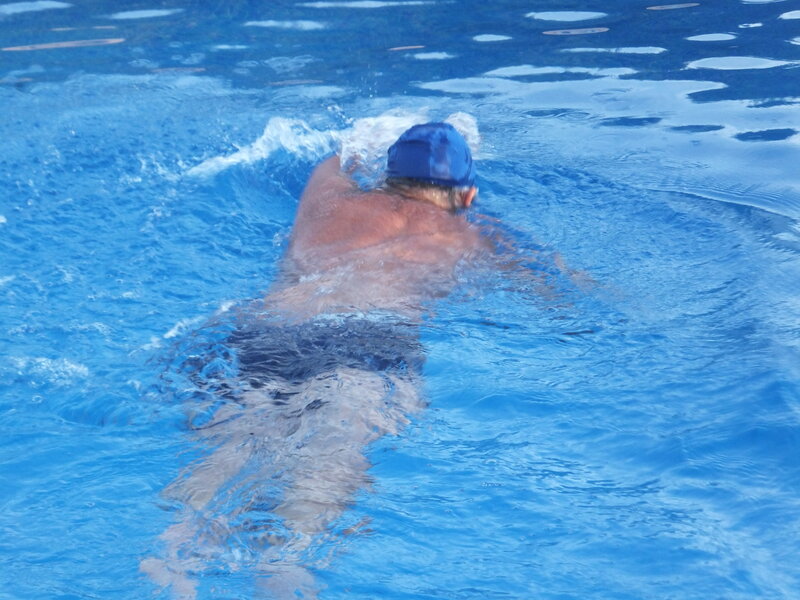 The Spanish pensioners get a subsidised week of holiday in the sun, so the hotels were full and business was good. We went to apply for our NIE numbers because we have been in Spain for some time now. Andy joined in the community singing on the beach…in Spanish and I listened to a guitarist. 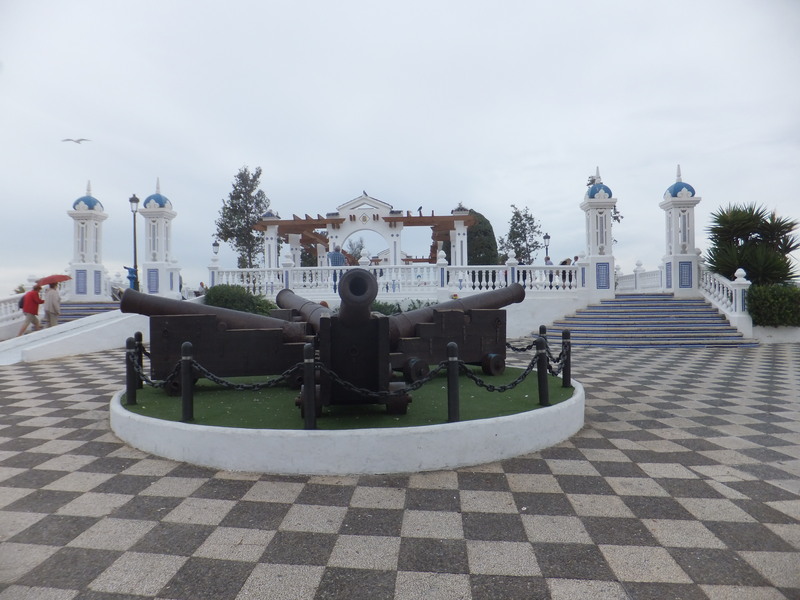 We had a nice lunch and a wander around the seafront. It’s all good! 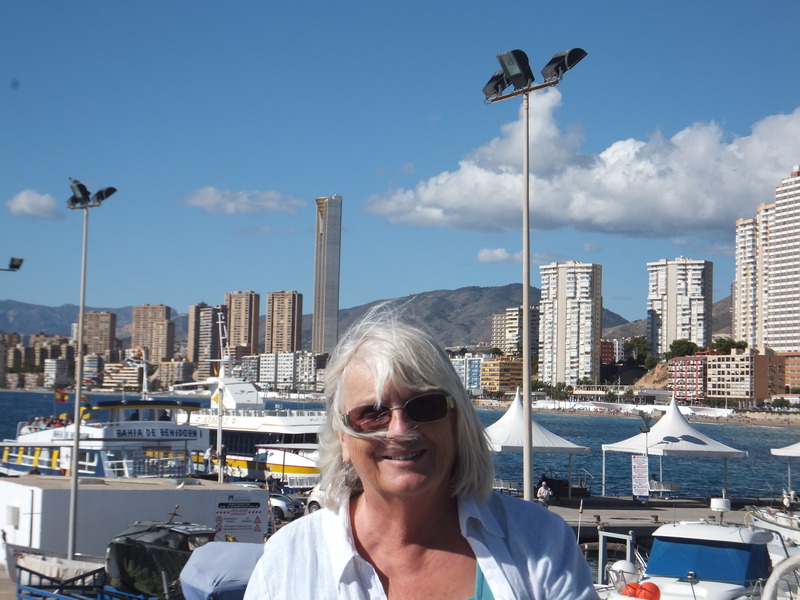 Well, it was about time we went up market, so we finally had a day in Benidorm yesterday. An interesting experience! It may be best known for high rise hotels full of drunken young English people who make lots of noise, fornicate enthusiastically and vomit in the streets, but in winter it takes on another personality entirely. The hotels are crammed with coachloads of ancient Spanish pensionistas ferried in from all the inland cities at virtually no cost to themselves to get a bit of winter sunshine. This is heavily subsidised by the national and regional governments as a vote buying exercise, and is probably largely paid for by the willing tax payers of Europe. The place was particularly crowded yesterday. Why? Good guess. Yet another blooming fiesta! I remember John Cleese doing a brilliant spoof on the touristic marvels of Venice many years ago. It started with him waxing lyrical about the timeless canals and the elegant gondolas which poled smoothly and serenely along them. By the end, he was incandescent with rage as every camera shot was filled with “another bloody gondola”. I am beginning to feel much the same about Spanish fiestas. We had driven forty miles to get our NIE tax certificate from the National Police office, only to find that it was closed for the fiesta. This particular one lasts three days and celebrates the life of St James. Three days every year for a minor Saint??? Add to that the fact that nobody will bother to go to work on the day before the fiesta because they are “preparing”, or the day after “recovering”, and you begin to get some idea of why the economy is in such doo-doo. The average number of days off per annum for “sickness” for Spanish civil servants is sixty-two. Add nineteen fiestas and twenty-one days holiday, and that makes 102 days off per year from a potential two hundred and fifty. Absolutely staggering! Sorry. Rant over. We actually had a very pleasant day even though we achieved absolutely nothing. 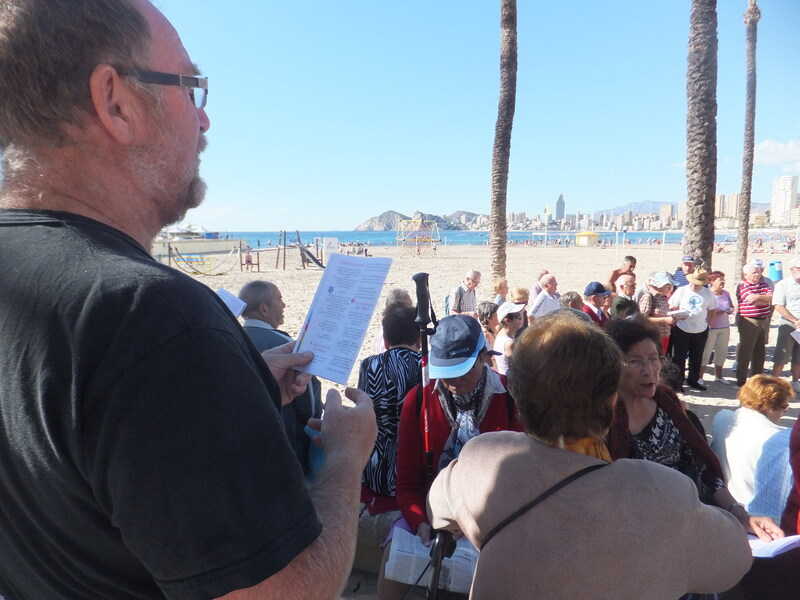 I had a good sing (in Spanish) with a group of about 200 pensionistas who formed an impromptu choir on the beach. Can’t imagine it happening in Worthing! We then had a pleasant lunch in a restaurant on the sea front. Sun shining, blue sky, gleaming water, lots of interesting people to watch. We’ve been in worse places! The weeks seem to be galloping rapidly by. The skies are still blue, but the days are a bit crisper and we now have to light the fire at five o’ clock in the evening when the sun goes behind the mountains, and it is dark by 6.30. We are both quite contented here but would love to have more visitors, so if you fancy a trip out between now and March, let us know. PS Would still love to know who our follower in Brazil is! We didn’t stay in the water for long! All quiet on the Spanish Front! Hi All, We haven’t posted recently because frankly there hasn’t been much interesting to report. 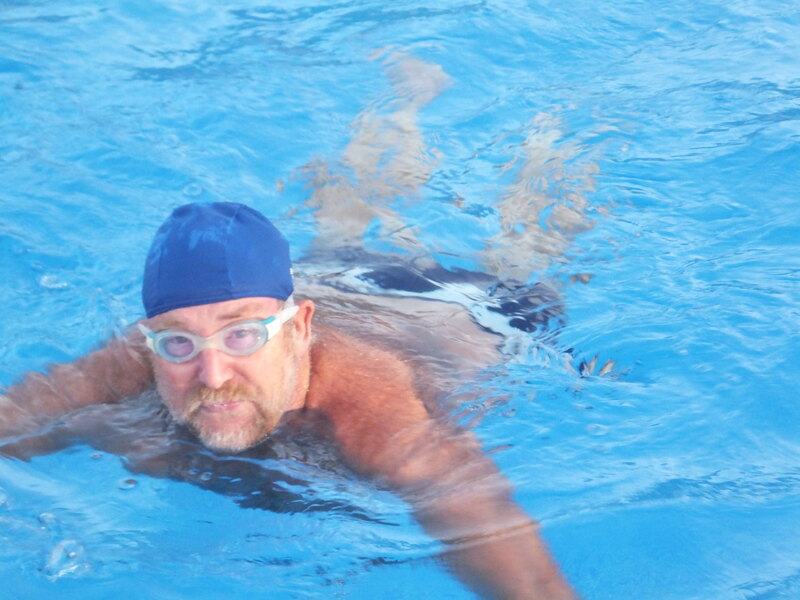 Weather is still brilliant and we are still swimming, but the water temperature is now down to about 19C so we will probably have to pack up soon. Clocks went back last week, so the evenings seem longer. At least we have a tv this year, though it is all in Spanish and mostly complete dross. Ann had a nasty stomach bug last week, which has helped considerably with losing weight, but is not necessarily the recommended way to do it. Our Spanish classes are going well, and we both feel we are making much more progress than last year. We are also going to Art classes with a lady called Julia Evans who has both of us working enthusiastically. She is a superb painter, and if anyone wants to get an idea of her work just google Julia Evans, artist, Benidoleig. I’m also busy with choir rehearsals at present as we have five performances before Christmas. One of the songs we are learning “Va Pensiero” in Italian, which is quite challenging but good fun. Our plans for the future are a bit up in the air again. Having gone off France because it is so expensive we had almost decided to buy here, but there are so many corruption scandals involving builders, planners and local politicians, plus the national government seems determined to move the tax goalposts to punish immigrants, so we are holding fire for a bit. Fifty one major figures were arrested last week in a corruption scandal involving more than 250million euros that seems to go all the way up to the Prime Minister, but nobody believes that they will be made to pay for it.